PokerStars closed Israel. At what poker rooms may Israeli players play? As we all know PokerStars has recently blocked access to its poker product to players from Israel. We decided to post a brief review of online poker rooms that officially accept Israel players and may replace Pokerstars as a main poker platform. Talking about regulation. Online poker in Israel is officially banned. There are some national lotteries and sportsbooks owned by the government and that's pretty much it. More than that - most of gambling websites including poker rooms are blocked by Internet providers just like in Russian Federation. Still there is something to choose from. A few foreign poker rooms still accept local players and can't be shut because are located and registered at other countries. Unibet is aimed to recreational players and strive to keep playing process fun and entartaining by involving their customers into daily tasks, achievement challenges and mini games. Along with that room strictly prohibits any 3rd party softwares including Holdem Manager and Poker Tracker. Players are free to change their nicknames once in a while. Waitlists are not available as well as table seating itself. Instead of this you are offered to choose a stake and a type of the game after which you are automatically seated at random table of selected kind. Along with that Unibet has something to offer to those who can still make money without stats and strict bumhunting kind of gaming. Traffic of the room is quite reasonable. At peak hours that fall on CET evenings 6-10 tables ae usually played at NL50$ / PL50$. 4-6 tables at NL100$ and 5-7 tables between NL200 - NL400$. Mobile versions of the software are also available for both Android and iPhone. Deposit Bonus: New poker players get a €200 Progressive Welcome bonus, casino players benefit from €100 with a 25x wager requirement and €25 risk free bet goes to sportsbetting players. Reload Bonus: Reloads are sometimes offered as a part of ongoing promotion. 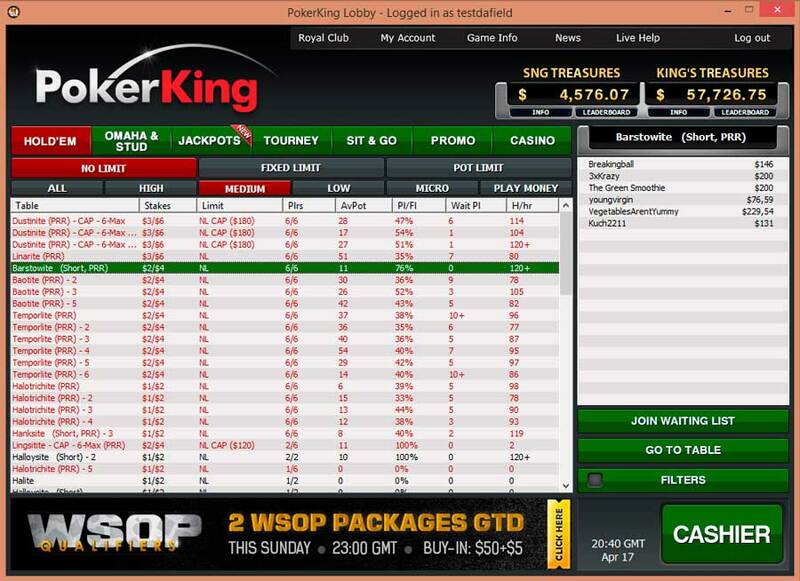 Pokerking is the best skin of Winning Poker Network (WPN) and one of the greatest choices for serious poker players from Israel. Hosting a huge "Beast" rake race, offering up to 33% cashback through vip system and 100% up to 777$ Welcome bonus - Pokerking has it all. Add to this a native support of poker trackers, stable payouts and fast poker client and you will get a perfect field to grind at. We also have some private promotions for players who accumulate high volumes of rake. Kindly get in touch with our crew to learn more. Deposit Bonus: New players get up to 777$ first deposit bonus. Betsson - is a huge company that ownes a few biggest brand names in poker industry. Poker room Betsson is a part of Microgaming (MPN) which is quite cool as network shows good traffic numbers these days and is known for stable cashouts and good customer support. Deposit Bonus: New players get up to €1000 of bonus credited right after their first deposit. Bonus is released in 2-4 segments, expires after 60 days and is worth approx. 20% cashback. Reload Bonus: Reloaded bonuses are sometimes offered by poker room. Please contact us directly to learm more. Good luck at the tables and have a profitable grind!